NASA onFriday revealed the six people who will blast off on what is currently thelast scheduled space shuttle mission. The list includes the agency?s top astronautand two others that are in orbit today. 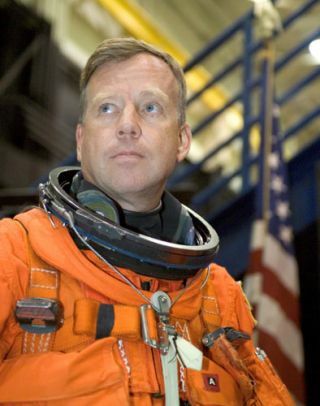 Veteranspaceflyer Steve Lindsey - NASA?s chief astronaut - will command the STS-133 shuttlemission to deliver supplies to the International Space Station. The shuttleDiscovery is slatedto blast off in September 2010 on the eight-day trek that - if NASA?scurrent plan holds - will mark the end of the shuttle era after 29 years ofspaceflight. ?It?s thefinal scheduled opportunity to take supplies tothe station, so they?re going to be taking a large number of supplies,? NASAspokesperson James Hartsfield told SPACE.com. ?Certainly, in that sense it?s acritical mission.? Joining Lindsey,who will make his fifth spaceflight on the mission, will be Air Force Col. EricBoe as Discovery?s pilot. Mission specialists Alvin Drew, Timothy Kopra,Michael Barratt and Nicole Stott round out the final planned shuttle crew. Allare veteran spaceflyers. Barratt andStott are currently flying aboard the International Space Station today asmembers of its long-duration Expedition 20 crew. Kopra just returnedto Earth last week with Discovery?s STS-128 crew to end his own two-monthflight to the station. ?I thinkthat?s a first, actually?certainly a first to have two of them in space,?Hartsfield said of astronauts being named to a future shuttle flight while stillaboard the station. Lindsey andhis crew will begin training for their mission next month, when he will hand over his chiefastronaut position to veteran spaceflyer Peggy Whitson. Whitson, whobecame the first female commander of the space station in 2007, will be thefirst woman to hold NASA?s top astronaut job. Is itthe last shuttle flight? NASA plansto retireits three shuttles in the next year or two after completing construction ofthe International Space Station. Six more shuttle missions are planned betweennow and Discovery?s STS-133 flight. The spaceagency plans to replace the shuttle fleet with new Orion spacecraft and theirAres I rockets, but they are not expected to begin operational flights until2015. NASA?s plan for human spaceflight, which includes returning astronauts tothe moon by 2020, is currently under review by President Barack Obama?sadministration. Anindependent White House committee has submittedseveral options for the president?s review, some of which includingextending the space shuttle program to fill in the five-year gap that currentlyexists between the shuttle?s retirement and its successor. ?We lookedat a lot of options in order to close the gap,? the committee?s chairman NormanAugustine, a former Lockheed Martin CEO, told a House subcommittee this week,adding that the gap would likely span seven years instead of five. ?The only viable option to close that gap is to continue to operate the space shuttle. ?